Now is the time – to learn about Korea! What better time to attend a book launch on Korea than with the North and South seeking an official end to the conflict! Stephen Gowans has devoted considerable study to how the Korean Peninsula has become a global flash-point, and painstakingly researched the role of the U.S.-led alliance in keeping Korea divided and at odds. Korea today is a place where nuclear-armed U.S. bombers fly along the North’s border, ready to show force to “defend America” thousands of kilometers away from the U.S. mainland. Overtures towards peace have regularly been rejected and interfered with by the United States, which supports the most saber-rattling of South Korean politicians, suppressing local doves. 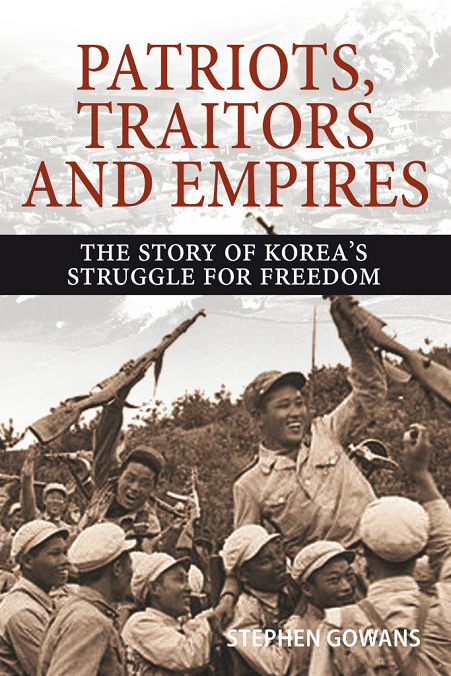 Now you can learn about Korea’s decades-long struggle to determine its own destiny in the face of outside interference, from guerilla warfare against Japan, to calls for Korean self-determination under today’s U.S.-led order. No book is more timely and more relevant than Gowans’ “Patriots, Traitors, and Empires,” releasing May 1 in Canada, and arriving on May 14 in Hamilton. Get it while it’s fresh! Stephen Gowans will be presenting on his book at 7:00 p.m. on the 14th at the New Vision United Church. He will be able to answer questions and sign copies of the book. WHERE: New Vision United Church, 24 Main Street West, Hamilton. WHEN: Monday, May 14, at 7:00 p.m.
FREE ADMISSION – Book is on sale for $25. Location: McMaster University Student Centre, Room 220, 12:30 p.m.